Established in 1987, Greenbarnes Ltd supply probably the widest range of notice boards and poster cases, both external and internal, available from a single manufacturer in the UK. Our ranges include many sizes and styles of traditional oak boards, an equivalent catalogue of maintenance-free recycled plastic boards and a complete spectrum of aluminium boards from the traditional to the ultra-modern. In addition to the supply of notice boards we also provide a wide range of signs, fingerposts and plaques as well as street furniture items including seating, planters, and cycle stands to a variety of clients in both the public and private sectors. Our services also include bespoke cabinet-making and we specialise in the design and supply of honours boards for schools, clubs and trade associations. Full details of all our products including downloadable product data sheets can be found on our website at www.greenbarnes.co.uk. 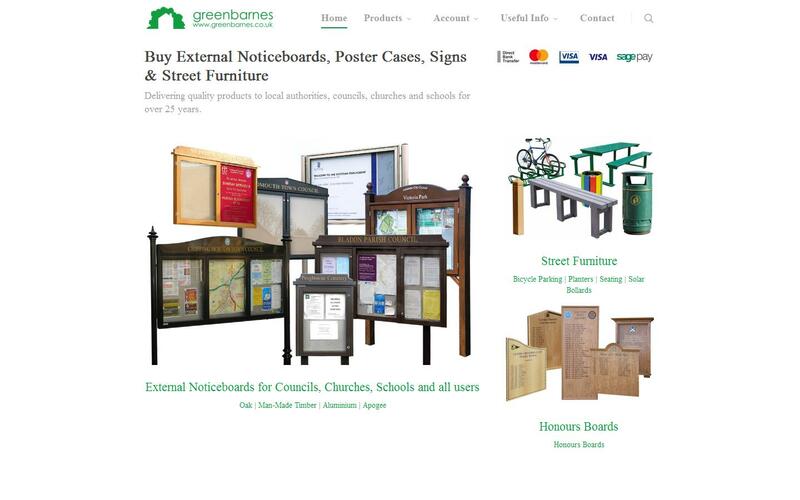 Alternatively, you can purchase many of our standard products directly from our dedicated online shop at http://www.the-noticeboard-shop.co.uk We appreciate that for many of our customers, buying a notice board or a bench or a sign is something that they will do only once in a lifetime, which is why we are always on hand to offer advice and support should it be required. Ring us today on 01280 701093. We are excited to announce that our new website is now live. This year was an important one for the Tendring Hundred Farmers Club being their Centenary Show. So often the signage of a school is a cocktail of mismatched and ill-considered elements – the product of years of piecemeal additions. A recent addition to the ever-expanding range of aluminium notice boards offered by Greenbarnes is the A-Multi range, designed specifically to meet the growing need for 2 and 3-bay notice boards which are both stylish and robust but which, at the same time are in keeping with the budget-conscious spirit of the moment. Greenbarnes ltd is pleased to announce the launch of V-Cases, a complete suite of superbly engineered contemporary poster cases and notice boards, all featuring clean aesthetics and the highest standards of engineering. 11/03/2013 - One image –23 years of experience. On the face of it, the image looks like the kind of unremarkable scene that can be witnessed in communities up and down the land. However, dig a little deeper and an interesting snippet of history is revealed. 22/01/2013 - Helping to get the message across. Of the thousands of pedestrians who use London’s Piccadilly daily, a fair proportion are no doubt aware of the existence of St James Church, one of over 50 churches rebuilt by Christopher Wren following the Great Fire. 02/10/2012 - “Green” notice board for Forest School. Maintenance-free recycled plastic notice board for "Forest School" project. To the teaching fraternity, the annual proliferation of “back to school” banners currently appearing in shop windows heralds the end of the long summer holiday and, in some cases no doubt, a feeling of deflation. An item on how town & parish councils, civic societies etc might choose to mark next year's Jubilee. Restaurant owners know that now, more than ever before, success depends upon creating a good first impression. National Trust has chosen 15 maintenance-free recycled plastic notice boards from the Greenbarnes Man-made Timber range for its Cragside propety in Northumberland. Cost-effective lighting is set to take a significant step forward with the introduction of our new solar-powered light post and bollard system. 22/06/2010 - Are You Providing for Pedal-power? Greenbarnes catering for the increasing demand for bicyle parking. The local population is ranked amongst the most resourceful of citizens, when it comes to their recycling activities. Many thanks for doing this so quickly and efficiently – much appreciated by us and AWE. Also, thanks for your fast turnaround on queries, offers etc, to coin a phrase – a pleasure doing business with you! We recently purchased 2 notice boards from your company, and you may remember my colleague Deborah Johnson visiting you last year to check out all the details. We are delighted with the notice boards and are receiving very positive feedback from all the parents and children at the school every day. So we thought that you might like to see the finished product in use and hence I have attached a few pictures of one of our Parents and Friends association notice boards of which we are very proud.